1. Google is EVERYWHERE ! The launch of Google Plus has been subject to huge debate, but what about: their recent purchase of Motorola, launch of boutiques.com (to you help "you find and discover fashion goods through a collection of boutiques curated by taste-makers"), Google web fonts, prize.org... the list goes on. This report on Googles monopolistic position online makes for interesting reading. This funny video about making the decision between Facebook and Google+ reminds us just how much Google already controls our online browsing, with the tagline "Google. Don't fight it." Sure, it was start-ups such as FourSquare, Gowalla that made location based promotions a success in 2010 - but now it seems like it will benefit the bigger players such as Facebook, Google and Groupon. 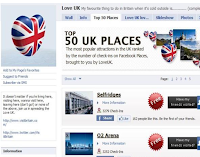 Facebook Places is proving a powerful marketing tool for small and large businesses alike, through favourite places leaderboards, discounts for checkins and creating event-specific places. 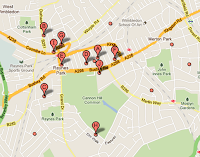 It remains important on Google to claim your local business listing, as these can impact localised search results. Just as green is the new black, touch is the new mouse. For over 20 years, humans used the practical keyboard and mouse to interact with computers. And indeed, many still do. But with millions of users now embracing new touch-screen platforms - such as iPhone, iPad or Android, it becomes important that your website is optimised for them. This could be in terms of icon size, page layout and efficient display of information. 4. Blogging IS BACK ! With the boom of microblogging and social networks, blogs seem to have been put on the backburner. Some website owners mistakenly believed that blogs were for the sole purpose of SEO - rather than a credible communication channel. Luckily, many seem to be realising the real power of blogging - and extensions (such as the Wordpress extension that makes a blog "mobile ready" ) mean that it's possible to satisfy the search, social and communication demands - without forgetting the true purpose of a blog! Here is a look back at some of our favourite blogs. With a growing amount of software available online (such as Salesforce.com, or Microsoft Office 365), why bother install and run your own servers? The "software as a service" concept often means a low ongoing cost, rather than a one-off payment. The Centre of Economics and Business Research suggests that cloud computing could even "generate over €763 billion [or $1.2 trillion] of cumulative economic benefits over the period 2010 to 2015" for the UK, France, Germany Italy & Spain, as well as over 2.3 million new jobs. 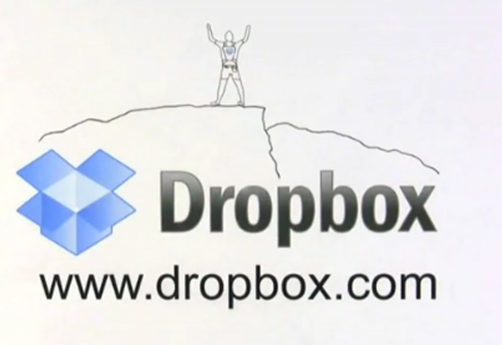 Dropbox is currently replacing USB keys - could your digital life soon be found in the cloud? A trend from 2010, and still growing. We're seeing more and more minimalistic sites, using large, bold paragraphs of text, giving the impression of a glossy brochure. Let's not forget the new upmarket digital magazines and literature applications for iPad, that have also been making full use the range of visual techniques. The launch of the 2011 Web Font Awards is excpected soon ( check out the video below). In the meantime, check out the Dmig5 or Quipsologies sites. Arguably one of the most exciting developments in the world of performing arts, is the increasing popularity of 3D. Leading to the critical aclaim and box office success of Avatar by James Cameron, high definition television, and futuristic video games effects. All requiring? 3D glasses. Just like this website (by digital agency Numiko), which we think may be the start of many to come. Built entirely in Flash, offering also an HTML version, the quality of the "illusion" is impressive. 8. 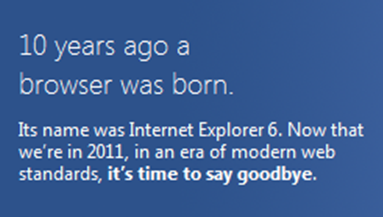 The end of IE6? If you have any questions, talk to our London web designers or just add your comment below. It's great that Google+ has changed its policy to invite only to now easy sign up method. I have always wanted to create an account there and now that I have one, I can easily say that it is far better experience than facebook. Indeed!